Our apostolate team has been spiritually enriched for many years as members of the Marian Movement of Priests (MMP). The MMP consists of priests, religious and laity who are bound in fraternal love for the Lord, His Church and each other and who are particularly devoted to the Blessed Virgin Mary. The Movement was formed by Fr. Stephano Gobbi in 1973 and since has spread to the farthest reaches of the globe. Members typically join together in cenacles of prayer, or small faith groups on a regular basis to invoke the Holy Spirit, pray the Holy Rosary, recite prayers for the Pope, read and meditate on a message given in the “Blue Book” and make the Act of Consecration to the Immaculate Heart of Mary. The “Blue Book” is the common name for the book, “To the Priests, Our Lady’s Beloved Sons” which contains messages allegedly dictated by the Blessed Mother to Fr. Stephano Gobbi between 1973 and 1996. These messages speak much to the critical times we are in at the very moment and usher us into the safe refuge of the Immaculate Heart of Mary. 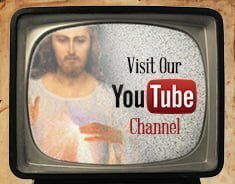 Through these messages, we gain a greater understanding of the signs of the times and the importance of our Consecration to the Blessed Mother and fidelity to Holy Mother Church. 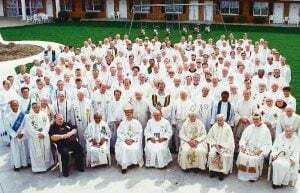 Effingham, IL – Oct. 10-14, 1994: Spiritual Exercises in the form of a cenacle with bishops and priests of the MMP from the North American continent. By means of these messages, [compiled in the Blue Book], Mary began to make use of Fr. 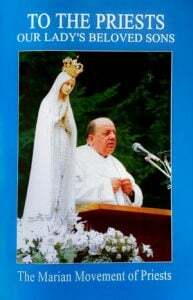 Gobbi as a humble instrument to gather all priests [and laity] who would accept her invitation to consecrate themselves to her Immaculate Heart, to be strongly united to the Pope and to the Church in union with him, and to bring the faithful into the secure refuge of her motherly Heart. Thus a powerful cohort would be formed and spread throughout every part of the world, created not with human means of propaganda, but with the supernatural power that emanates from silence, prayer, suffering and constant faithfulness to one’s duties. Plan to gather with as little as two or three others. Most cenacles meet weekly, but others meet once a month. Plan for a time that will work for your members, but it is important to meet on a regular basis. For several years we belonged to a cenacle consisting of four families. Four sets of parents along with 11 kids, three girls and eight boys, would meet every third Monday. We rotated between our four homes beginning promptly at 7 pm and walking out the door by 9 pm. After the rosary and prayers, we had dinner together. The host home would prepare the main dish and each family would contribute a dessert or salad or drinks. Each family looked forward to Cenacle night. It was indeed a faith enriching experience that was also fun and that continues to bless each one of us who prayed together during that time. For more information on how to form a cenacle and more see the MMP-usa.net. On-line Donation Simply click DONATE and complete the donation process for whatever amount you can offer for the book or books. (The customary donation is $25 per book as notated above.) In the NOTES section please indicate the number of books you would like and where to send them if it is different from your billing address. Just Call Call our office 830-634-7765 and we’ll take your order over the phone. Check in Snail Mail Mail a check to Divine Mercy for America (or DMFA) along with a note with all the order details. Mail to DMFA PO Box 202, Center Point, TX 78010. Free If you are unable to afford a donation of any kind for the expense of the book or postage, then we will donate one to you for your use. Email info@divinemercyforamerica.org, give us a call, or send us a note as mentioned above and let us know where to send it. 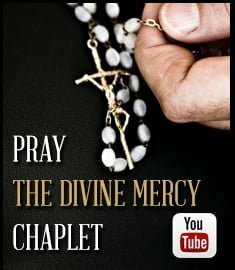 We’ll get one in the mail to you with a request that you to say a rosary for the Divine Mercy for America Prayer Campaign and Network and our benefactors who make our work and the book donation possible. If you have any questions or difficulties just email info@divinemercyforamerica.org and we’ll help you out. From time to time we are led to a message in the Blue Book that we feel speaks to us in a particular way, especially in light of the Divine Mercy for America Campaign. 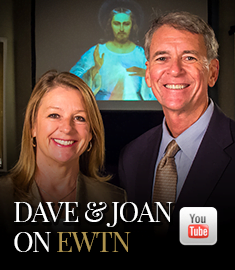 By means of these messages, we personally believe our Lady is leading and guiding us in these most critical times. Visit www.mmp-usa.net for complete details about the Marian Movement of Priests, Cenacles of Prayer, History, etc.